James M. Schmidt’s newest from History Press Galveston and the Civil War: An Island City in the Maelstrom went from no firm date to on the shelves. The Chattanooga Campaign edited by Steven E. Woodworth and Charles D. Grear with contributions from Sam Davis Elliott, Alex Mendoza, Timothy B. Smith and Ethan S. Rafuse continues this excellent western series. 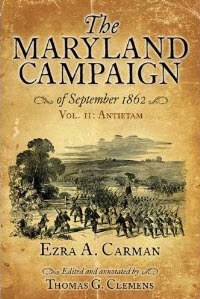 THE MARYLAND CAMPAIGN OF SEPTEMBER 1862: Volume II, Antietam by Ezra Carman edited by Thomas Clemens is due the 15th. The good news is that a third volume will cover the campaign after Antietam. We Have the War Upon Us: The Onset of the Civil War, November 1860-April 1861 by William J. Cooper captures the sense of contingency, showing Americans in these months as not knowing where decisions would lead and how events would unfold. To Antietam Creek: The Maryland Campaign of September 1862 by David S. Hartwig is the first of a two-volume set on Antietam. The Fire of Freedom: Abraham Galloway and the Slaves’ Civil War by David Cecelski is the story of a former slave that worked for the Union, even has he fought them for equality, in the Union-occupied parts of North Carolina. Clash at Kennesaw: June and July 1864 by Russell W. Blount, Jr., looks at this important part of the Atlanta Campaign. You may have read the author’s The Battles of New Hope Church published in 2010. 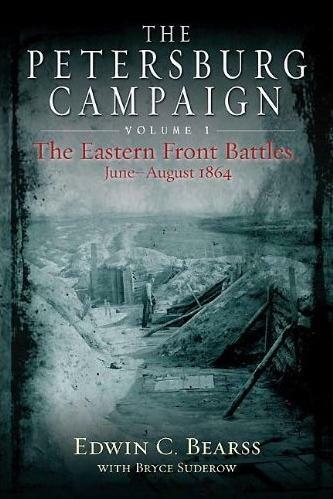 The Petersburg Campaign: The Eastern Front Battles, June – August 1864, Volume 1 by Edwin Bearss and Bryce Suderow is a “must have” book. This is 488 pages with 25 original maps by Civil War cartographer George Skoch. The Caning: The Assault That Drove America to Civil War by Stephen Puleo is an in-depth look at Preston S. Brooks’ beating of Charles Sumner. While often referenced, I do not know of a book that looks at it. Ten Roads Publishing is releasing Gettysburg Glimpses II: More True Stories from the Battlefield by Scott L. Mingus Sr.
Civil War Journalism by Ford Risley looks at the personalities that told America and the world about the war. The Man Who Saved the Union: Ulysses Grant in War and Peace by H. W. Brands is a 736-page biography by this respected author. The Enemy Never Came: The Civil War in the Pacific Northwest by Scott McArthur looks at people “deeply affected by the war yet unable to do much about it”. This Wicked Rebellion: Wisconsin Civil War Soldiers Write Home by John Zimm looks at Wisconsin’s participation through letters drawn from the Wisconsin Historical Society’s archives. 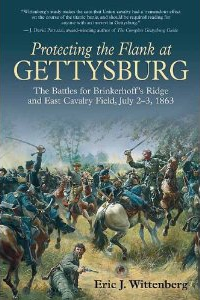 Eric Wittenberg’s Protecting the Flanks: The Battles for Brinkerhoff’s Ridge and East Cavalry Field, Battle of Gettysburg, July 2-3, 1863 is a new edition with a new map, additional illustrations, two new appendices, and other material. THE BATTLES THAT MADE ABRAHAM LINCOLN: How Lincoln Mastered his Enemies to Win the Civil War, Free the Slaves, and Preserve the Union by Larry Tagg is a renamed paper edition of THE UNPOPULAR MR. LINCOLN: The Story of America’s Most Reviled President. Civil War America: A Social and Cultural History with Primary Sources by Maggi M. Morehouse and Zoe Trodd looks at America during the war. With an accompanying website this could be a treasure chest for research. This book is affordable in paperback. 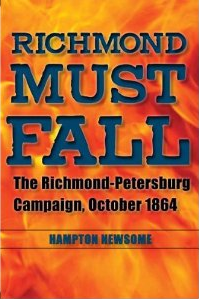 Richmond Must Fall: The Richmond-Petersburg Campaign, October 1864 by Hampton Newsome begins with one of Lee s last offensive operations of the war at the Darbytown Road on October 7, 1864, and ends with Grant s major offensive on October 27 to seize the South Side Railroad, the last open rail line into the Confederate stronghold at Petersburg. Brady’s Civil War Journal: Photographing the War, 1861-65 text by Theodore P. Savas, photographs by Mathew Brady. GENERAL GRANT AND THE REWRITING OF HISTORY: How a Great General (and Others) Helped Destroy General William S. Rosecrans and Influence our Understanding of the Civil War by Frank Varney could be subtitled “Revenge of Rosy” is a book that should set the pot to boil. A General Who Will Fight: The Leadership of Ulysses S. Grant by Harry S. Laver looks at Grant’s leadership during the war. THE SECOND DAY AT GETTYSBURG: The Attack and Defense of the Union Center on Cemetery Ridge, July 2, 1863 by David Shultz and David Wieck expands on the critically acclaimed The Battle Between the Farm Lanes. The book is a completely revised and expanded study, with new photographs, original maps, and a self-guided tour of the fighting. The LAST BATTLE OF WINCHESTER: Phil Sheridan, Jubal Early, and the Shenandoah Valley Campaign, August 7 – September 19, 1864 by Scott Patchan looks at the third Battle of Winchester the largest, longest, and bloodiest battle fought in the Shenandoah Valley. This book is in the finial proofing stage and on schedule. ROBERT E. LEE IN WAR AND PEACE: Photographs of a Confederate and American Icon by Donald Hopkins uses the 61 known images of Lee to provide a sweeping history of Lee’s life and a compelling discussion of antique photography. Scott L. Mingus Sr.’s Confederate General: Gov. William “Extra Billy” Smith: From Virginia’s Statehouse to Gettysburg Scapegoat tells us about the oldest and one of the most controversial Confederate generals on the field at Gettysburg. Civil War Dynasty: The Ewing Family of Ohio by Kenneth J. Heineman looks at this important family is scheduled for Christmas eve. Maybe Santa will deliver them to a books store near you. Freedom National: The Destruction of Slavery in the United States, 1861-1865 by James Oakes looks at how Republicans pursued an antislavery agenda throughout the war. While they may have been pragmatic in policy, they were steadfast on principle. 38 Nooses: Lincoln, Little Crow, and The Beginning of the Frontier’s End by Scott W. Berg looks at the “Big Picture” of the 1862 Sioux war. Interpreting Sacred Ground: The Rhetoric of National Civil War Parks and Battlefields by J. Christian Spielvogel “studies and analyzes how” the National Parks Service presents our battlefield parks. This could be a love it or hate it book but should be interesting. The Iron Way: Railroads, the Civil War, and the Making of Modern America by William G. Thomas III looks at railroads and telegraph lines from the 1838 to 1869. Standing Firmly by the Flag: Nebraska Territory and the Civil War, 1861-1867 by James E. Potter i9s the first book to look at Nebraska’s contributions during the Civil War. Bison Books, the publisher, has an excellent reputation for books on the American West. Look for Alex Mendoza’s Chickamauga 1863: Rebel Breakthrough. This is one of the “Bright Lights” of the western ACW historians and authors. The Northern Home Front during the Civil War edited by Randall M. Miller and Paul A. Cimbala promises a great deal in 250 pages. The Petersburg Campaign, Volume 2: The Western Front Battles, September 1864 – April 1865 by Edwin Bearss and Bryce Suderow is a “must have” book. This is 504 pages with original maps by Civil War cartographer Steven Stanley. Captives in Blue: The Civil War Prisons of the Confederacy completes Roger Pickenpaugh’s earlier groundbreaking book Captives in Gray: The Civil War Prisons of the Union, rounding out his examination of Civil War prisoner of war facilities. Searching for George Gordon Meade: The Forgotten Victor of Gettysburg by Tom Huntington is an over due biography. Moved to April 2013 is Edifice of Freedom: The Civil War Amendments in Historical Perspective by James S. Hunphreys looks at the 13th, 14th & 15th Amendments in detail. The book looks at both the historical and contemporary significance of the Civil War Amendments. In May 2013, look for Shiloh: Confederate High Tide in the Heartland from Steven E. Woodworth. Steve Stanley and J. David Petruzzi are hard at work on The Complete Antietam Campaign Guide. Antietam Chief Historian Ted Alexander is penning the Forward. This is a full color book styled on The Complete Gettysburg Guide. The book will feature Harpers Ferry, South Mountain, Antietam, and Shepherdstown plus many points in between. Eric Wittenberg is working on a project is for The History Press entitled The Battle of Yellow Tavern: Jeb Stuart’s Last Battle. This will be a study of Phil Sheridan’s May 1864 raid on Richmond, with particular focus on the May 11, 1864 Battle of Yellow Tavern, where Jeb Stuart is mortally wounded. Yankee Dutchmen under Fire by Joseph Reinhart should be in the stores in 2013. From talking to Dave Powell, during his Chickamauga weekend, his history of this battle is growing. 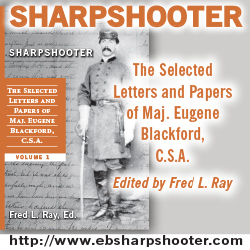 Savas-Beatie publishing is talking about a multi-volume history of the Chickamauga Campaign. No publication date is available but Dave has the manuscript well in hand. Dave Powell is the author of The Maps of Chickamauga: An Atlas of the Chickamauga Campaign, Including the Tullahoma Operations, June 22 – September 23, 1863 and Failure in the Saddle: Nathan Bedford Forrest, Joe Wheeler, and the Confederate Cavalry in the Chickamauga Campaign. Tom Desjardin’s biography of Joshua L. Chamberlain is due out in 2013. Ethan Rafuse and Charles R. Bowery Jr. are working on a War College guide for Richmond-Petersburg expected in 2012. Supporting the September publication of War on the Waters: The Union and Confederate Navies, 1861-1865 James M. McPherson’s will be appearing at the following locations. Bland Simpson author of Two Captains from Carolina: Moses Grandy, John Newland Maffitt and the Coming of the Civil War on OCT 4 is at the Museum of the Albemarle, Elizabeth City NC. OCT 5 David S. Cecelski author of The Fire of Freedom: Abraham Galloway and the Slaves’ Civil War at 7PM will be at Regulator Bookshop, Durham NC. On October 20, author Lance Herdegen will be doing a virtual book signing at Abraham Lincoln Book Shop for his new book The Iron Brigade in Civil War and Memory. More information about the event can is on the website and here: http://www.virtualbooksigning.net/virtualbooksigning.html. Do you need a “writing coach”? Writing more than reviews is a task that I am not confident of, hence the title of my column. However, more than a few have the “writer itch” but need some help. James Schmidt is the author of a number of books and articles on the Civil War. James always coached friends trying to write. Now this is becoming a formal activity. If you need a non-fiction writing coach, have questions about the publishing process or just need some encouragement he is available. James is on gmail at schmidtjamesm, the initial consultation is free. A website is expect in November. In an effort to support, sesquicentennial publishing this will be part of this column through 2015. If you know of a book, please contact me so it can be included. New Jersey Goes to War part of the New Jersey Civil War Sesquicentennial is in its’ second printing. 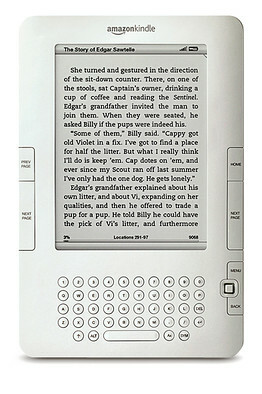 It is so popular that New Jersey’s Odyssey using the same format is available. This book is “An Anthology of Civil War Tales from 1850 to 1961”; Joseph G. Bilby edits both books. Discover Your Community’s Civil War Heritage, by Steven D. Glazer, is a comprehensive and up-to-date manual for those wishing to research the stories of their own community’s Civil War veterans. The New Jersey Civil War Sesquicentennial Committee just published New Jersey at Gettysburg Guidebook by David G. Martin. This is an outstanding look at New Jersey’s units at this battle both during and after the battle. The book is full of photos of monuments, men and woodcuts. A series of maps follows the battle and marks monuments. The 12th NJ plays a major role in the Battle for the Bliss Farm and that is well covered. The New Jersey Civil War Sesquicentennial Committee is making a major effort to commemorate their state’s contributions. All are available from www.njcivilwar150.org 100% of the purchase price goes to support the New Jersey Civil War Sesquicentennial. All those involved contributed their time and contributions paid for printing. Civil War Voices from York County, Pennsylvania: Remembering the Rebellion and the Gettysburg Campaign by Scott L. Mingus Sr. and James McClure contains the rich oral tradition coupled with letters, diaries, photographs and newspaper accounts to tell the stories of York in those bleak days 150 years ago. They give a vibrant voice to those living, serving and dying in this most tumultuous period in America’s history. Adams County-based Colecraft Industries is the publisher. The authors coordinated the project with the Pennsylvania Civil War 150, the York County Heritage Trust and the York Daily Record/Sunday News. Lists the book America on the Eve of the Civil War edited by Edward L. Ayers and Carolyn R. Martin, as 160-page book with four black & white photos.